Seven stars and personalities will again appear at the annual Royal Children’s Hospital Good Friday Appeal next week in Melbourne. The event has been broadcast for 56 years on Seven Melbourne, helping to raise $245 million for a good cause. This year’s event will include faces from Seven News, Home & Away, Winners & Losers, Packed to the Rafters, The X Factor, Sunrise, The Morning Show, My Kitchen Rules, Coxy’s Big Break and the sporting and music industries. 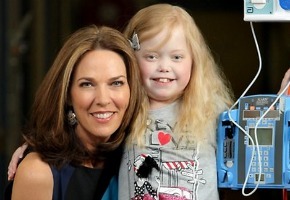 Channel Seven Melbourne is proud to telecast the 2013 ROYAL CHILDREN’S HOSPITAL GOOD FRIDAY APPEAL live from Etihad Stadium on Friday, March 29 from 9.00am. The biggest names in television and entertainment will gather for what promises to be the most spectacular Good Friday Appeal yet, with all money raised going towards medical equipment and research at the hospital. This iconic and unrivalled fundraising event – which started in 1931 and has been broadcast by Seven for 56 consecutive years – brings together people from all parts of the community with the common goal of helping Victoria’s sick kids. THE ROYAL CHILDREN’S HOSPITAL GOOD FRIDAY APPEAL has so far contributed more than $245 million to the Royal Children’s Hospital. Victorians donated a record breaking $15,820,640 in 2012 and the Good Friday Appeal is aiming to create a new record in 2013. Throughout the day and night your favourite Seven stars will join the telecast including Good Friday Appeal ambassador JENNIFER KEYTE, PETER MITCHELL, HELEN KAPALOS, MELISSA DOYLE, DAVID KOCH, KYLIE GILLIES, GRANT DENYER, KERRI-ANNE KENNERLEY and MOLLY MELDRUM – just to name a few. Plus live performances in the evening by SAMANTHA JADE, THE COLLECTIVE, MARK SEYMOUR, a very special SUPERGROUP, and many more. Also joining the telecast panel and taking calls in the phone room will be Home and Away stars JOHNNY RUFFO, ANDREW MORLEY and CHARLIE CLAUSEN; Packed to the Rafters favourite GEORGE HOUVARDAS; X Factor host LUKE JACOBZ; and the cast of Winners and Losers, including VIRGINIA GAY and ZOE TUCKWELL-SMITH. The telecast begins at 9.00am with SANDY ROBERTS in the hosting seat. During the morning Sandy will cross to NICK McCALLUM and JENNIFER KEYTE at the Royal Children’s Hospital and GIAAN ROONEY out on the Etihad Stadium concourse for cheque presentations. Sunrise’s MARK BERETTA and Winners and Losers favourite DAMIEN BODIE will be manning the phone room throughout the day and night, with NATHAN TEMPLETON and HAMISH McLACHLAN chatting with various sporting personalities and guests passing through. And Seven News’ DEAN FELTON and REBECCA MADDERN will keep us up to date on the country board. Seven News Health reporter KAREN O’SULLIVAN will be providing an update on patients throughout the day, while AMY PARKS will be on the road down at Geelong, visiting the new phone room at Geelong Pier and covering fundraising events from the Geelong Foreshore, Ocean Grove and Queenscliff area. The telecast will pause for a special 30 minute Seven News bulletin at midday hosted by REBECCA MADDERN and again at 6.00pm for Seven News and Today Tonight. Then at 7.00pm, Sunrise hosts DAVID KOCH and MELISSA DOYLE will introduce the action-packed night of entertainment. The evening telecast will feature live performances from JOHNNY RUFFO, THE COLLECTIVE, SAMANTHA JADE, COSENTINO, MARK SEYMOUR, BRIAN CADD AND THE BOOTLEG FAMILY BAND, and a special Good Friday Appeal formed SUPER GROUP with DARYL BRAITHWAITHE, JOE CAMILLERI, ROSS WILSON and JAMES REYNE. The casts of COXY’S BIG BREAK and MY KITCHEN RULES will also be in attendance. This year, the face of the Good Friday Appeal is three year old Isla Hallam who was diagnosed at age 17 months with acute lymphoblastic leukaemia. Now in remission, Isla’s fragile smile and golden locks grace the 2013 Good Friday Appeal poster to encourage all Victorians to donate. More than 600 volunteers manage the phone lines in the tally room and hundreds of other volunteers are involved in a variety of ways throughout the day. A record number of regional cities, towns and hamlets will take part in raising funds for this year’s Appeal. A record 230 regional fundraising managers, including CFA volunteer groups and service clubs and pubs have registered to tin rattle and fundraise across Victoria and Southern NSW for this year’s 82nd Appeal. The Appeal’s strength lies in the thousands of volunteers who give of their time, expertise and creativity to ensure the event is successful and the rewards are great. So switch on, donate and join in on the magic that is the Good Friday Appeal. 56 years going strong is bloody brilliant. However. “Home & Away star Johnny Ruffo” LOL it kind of actually made me cringe. Keep dreaming 7. Even in that horrible ad i can see that he’s as wooden as a two-by-four, even more so than some actors on there. It would be really great if Seven would show this on 7two but again they are not doing it.